A friend turned me onto a popular Instant Pot butter chicken recipe. With a few tweaks, it became a huge hit in my house! So I’m posting it here to share. Enjoy! In your Instant Pot, on Saute, melt the butter and coconut oil. Add the garlic, ginger, turmeric, cayenne, paprika, garam masala, cumin, and salt, and let bloom for a minute. Add canned tomatoes and mix thoroughly. Place the chicken pieces on top of the sauce. Lock the lid into place. Select Manual, and adjust the pressure to High. Cook for ten minutes (12 minutes if using frozen chicken pieces). Let the pressure release naturally. Unlock the lid. Carefully remove the chicken and chop into cubes. Add the coconut milk. Using an immersion blender, whizz the contents of the pot into a smooth sauce. Add the chopped chicken back to the sauce. You can rewarm it if needed. Serve over rice (or, if you are low-carb like me, shirataki noodles. My current fave is Miracle Noodles.) Top with chopped cilantro and a scoop of plain thick yogurt. The earthy morning scent of fall is getting stronger, so even though I’m not ready for summer to end yet, it’s clearly time to yank the basil. I had four Genovese plants that were big and bushy, all trying their best to sneak their flowers under my nose. I pulled ’em out whole, and stuck their roots into a bucket of water. The fragrant bouquet graced my back porch for a few days, until I made it to Costco for the rest of the supplies. Tonight was the big Pestoing! It smells better than it looks, and tastes even better than it smells! Now some folks insist you need to break out the mortar and pestle (after all, the fact that the words “pesto” and “pestle” are so similar isn’t an accident). But if you have a LOT of basil to process, and your kitchen assistants have limited attention spans, you’ve got to call in the big guns sometimes. Makes about 12.5 oz. of pesto sauce, which should be plenty for about 3 pounds of cooked pasta. You can freeze it if you’re not going to use it in the next day or two, but be sure to leave plenty of time for your pesto to defrost… do NOT warm it up or use the microwave to defrost it! Heat will destroy your bright, beautiful flavors. When you want to use it, add it directly to the cooked, drained pasta, adding a quarter cup or so of reserved pasta water to help distribute the pesto evenly. Optional add-ins: cup of frozen corn, can of drained black beans, a chopped jalapeño, a diced zucchini, a can of drained black olives, a couple cloves of crushed garlic, a can of diced tomatoes, substitute pulled pork for the chicken… whatever sounds good to you! Enchiladas are less of a recipe than a technique. Feel free to be creative and try something offbeat! Spray a 9″x13″ baking pan with nonstick spray and set aside. Preheat oven to 350°. Sauté onions and bell pepper in olive oil in a large skillet until soft. Add cumin and salt, stir. (Now would be a good time to incorporate any of the suggested add-ins, if you like, or just keep it simple.) Add chopped chicken and canned green chilis, and heat through. Add the entire brick of cream cheese, cover with the hot mixture, turn heat to low and let melt. Once it’s all gooey, turn off the heat and mix well. Open your can of sauce and get a small ladle. Ladle a few spoonfuls of sauce into the baking pan and tip to let the sauce more or less cover the bottom. Now it’s assembly time! Lay four corn tortillas to cover the bottom (I usually lay out three and break up the fourth to cover the open spaces, but don’t stress if it’s not a perfect layer). Scoop half the warm chicken mixture on top of the tortillas and spread. Sprinkle half of your quesadilla cheese over the meat. Pour about a third of your can of sauce over the cheese. Lay out four more tortillas, then the other half of the meat mixture, the rest of the cheese, and another third of the sauce. Lay out the final four tortillas, and pour the rest of the sauce over the top (try to make sure all of the tortillas get at least a little sauce on them). One year and one day ago, I plunked down $60 for a Kickstarter campaign for a knife that Kenji Lopez-Alt over at Serious Eats called “the holy grail” of kitchen cutlery: “Incredible quality and design, high-end materials, perfect balance, and a razor-sharp edge.” Swoon… I was hooked. I’ve been working with my beloved Cooks Illustrated-recommended 8″ Victorinox chef’s knife for over eight years, but it’s had a few misadventures and been chipped and bent along the way. It’s still a fantastic deal at $45, but Kenji’s gushing and my desire for a grown-up knife pushed me over the edge and I took the plunge. I became a Misen backer. Now, I’ve done enough Kickstarters to know how this goes. You pays your money and you takes your chances. My strategy is to mostly try to forget about the project, though I do take a peek at the emailed updates that are sent out. The less anxious I am about whether I threw away my money, the happier (and more pleasantly surprised) I am when the object actually arrives. This one was supposedly due in May; five months isn’t all THAT bad a delay. I figure I’m investing in someone learning a LOT about business, production, and customer relations in a short amount of time, so I wasn’t really all that worried. But still… I was curious, and when I got my notice telling me my knife was on the way, I admit that I started stalking the tracking page. The box arrives, a year and a day after pledging. Snazzy, innit? One of the production issues that held up the delivery of the knife was the packaging, so since they went to all the trouble of redoing the packing materials, I figured I do a series of unboxing photos to properly appreciate their efforts. Inside was a little shrinkwrapped packet that held the plastic knife guard that was a perk for Kickstarter supporters. It’s plastic with some soft stuff inside. Nothing special, but yay for a free knife cover! Now we’re getting to the good stuff. There’s a paperboard slipcover over the main box, which feels very solid and rigid. I was a little puzzled as to why they spent a nontrivial amount of money on the box presentation (I mean, you don’t have to convince us, we’ve already bought the darned thing, right? ), until I remembered that our knives come with a lifetime sharpening service. So we’ll need a sturdy safe box to transport the knife back and forth… guess I’m going to hang on to the old Victorinox for the week or so that the Misen is out for her spa days! and on the other side, some carrot bits for inspiration. I pulled out my Victorinox to compare the two. The biggest difference that I noticed immediately was the balance of the weight. I can balance the Misen with my finger right where the blade meets the handle, but if I put my Victorinox on my finger the same way, it pitches forward… this means I am always spending at least a little energy pushing down on the handle in an effort to keep the tip of the knife up, whereas with the Misen it sort of hovers in my hand effortlessly. I know it sounds kind of dumb now as I’m writing it, but it really does feel different. How much that extra effort spent to deny gravity costs me in wrist/arm fatigue, I have no idea. But it’s not nothing. I would guess that, by far, the thing I chop the most with my chef knife is veggies, and the veggie I chop almost daily is onions. So I put the Misen through its paces, and found it to be very nice to use. I mean, it’s brand new and razor sharp, so I didn’t expect anything less. But there was no awkwardness or skipping, nothing felt strange, and the knife felt controlled and precise. After I chopped half an onion, I tried the Victorinox to compare. It’s not at it’s sharpest right now, and it skipped along the surface of the onion a bit, but the biggest difference between it and the Misen was the height of the blade. The Victorinox has a taller blade, and it was definitely most noticeable when I was slicing the onion held between the thumb and fingers of my left hand… it was definitely harder to manipulate the knife because I had to tent my palm high over the cutting surface to make enough room for the knife to maneuver. The shorter knife was more nimble; it was easier to hold the onion, more stable, and closer to the cutting surface. I’m going to go out on a limb and say that this feature will make the Misen a safer knife, as well. If the Misen sounds like something you’d be interested in, the company is taking names for a waitlist for the second production run. If you’re wavering between the Victorinox or the Misen, I’d urge you to go with the Misen. But the company definitely has issues with their production times, so if you need a knife to work with right now, you will not be at all sorry to have the Victorinox in your hands. Still, I’m very happy with my Misen so far, and I’d love to hear from others who got one as well. Heat the oil in a big, heavy-bottomed pot. Sauté the onion and garlic until soft. Add the sausage and kale, keep stirring until the kale wilts a bit. Add in the beans, tomatoes, salt, and pepper, and stir until combined. Add a little water if it seems too dry, and let it simmer a bit to let everyone get comfy with each other, maybe 10 minutes or so. You can also add a cup or two of broth to make it more soupy if you like. If you don’t have tomatoes on hand, you can add a shot of balsamic vinegar to get the touch of acid. It’s a pretty forgiving recipe, just use what you have and it will be great! Everytime I eat this, I feel like a swarthy Eastern European peasant who just finished clearing rocks out of the field. Hope you enjoy it, too! So CineFix posted a video listing their top ten choices for most beautiful animated films of all time, along with mentions of a couple dozen runner-ups. I thought they were missing a few, and so did some of the commenters. In a surprisingly civil discussion (for YouTube, at any rate), I read many suggestions for other people’s top picks. I thought it would be nice to have the whole thing compiled into a single list, so I could quickly find a movie to watch when I had some downtime… and I figured someone else might like to see it as well, so I’m posting it to my (sadly neglected) blog. 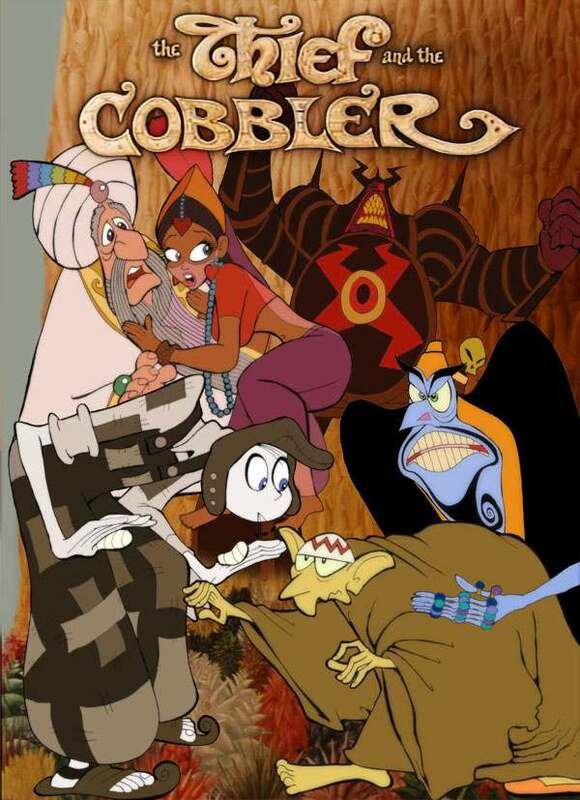 Many commenters joined me in expressing great surprise that Richard Williams’ The Thief and The Cobbler (pictured above) had not made it onto the list. if you are any fan of animation history whatsoever, you MUST go watch the Recobbled Cut as soon as possible (link in the list below). As of today, I’ve seen 62 of the 142 films listed below… I’d love to hear if you thought we missed one of your own favorites! I wanted to find a way to make a nourishing, succulent, moisturizing hand lotion or cream at home, mostly as a holiday gift but also for myself. I found lots of ideas, and finally settled on this version. I did the original from Rawmazing with the shea butter, and it indeed felt absolutely silky and rich, but I think the stuff I got was heading into rancid and the resulting butter wasn’t as delicious-smelling as I’d hoped. So I changed it up a bit, and am now using this formula. I was fixing another batch tonight and thought I should share it with you all… it’s SO easy and it feels SO good! I bring a little Tupperware container of it with me to use after I do my deep water therapy (followed by the jacuzzi, the wet and dry saunas, and a long hot shower)… after all that water, my skin is really stripped and needs a little pampering. This stuff does the trick, and smells so delicious! Melt cocoa butter and coconut oil together on low heat or in a double boiler. Let cool for 30 minutes. Stir in almond oil and vanilla. Place oil mixture in freezer until oils partially solidify (about 20 or 30 minutes). Whip with the whisk attachment on your kitchen mixer until you get a creamy butter-like consistency. Store in clean jar and enjoy! Feel free to swap other oils, but remember to keep the ratio 75% solid to 25% liquid.